With a Homido V2 VR headset on hand, users can watch classic 3D videos, 360-degree videos, VR games as well as education and science content onto it. Homido operates with almost any smartphone that has an accelerometer and gyroscope, makes it popular among the market. When it comes to watch some 3D ISO image files on Homido V2 VR, some users may find it’s a painful time to enjoy it due to video format incompatible issue. Let’s find the solid solution here. Actually, Homido V2 headset and Homido VR player support 3D videos playback but limited to 3D Side-by-side mp4, mkv, etc formats. In order to make 3D ISO image files playable on Homido V2 VR, you’ll need to transcode and convert 3D ISO to Homido V2 supported 3D SBS videos in advance. To finish the task, Brorsoft Video Converter Ultimate (Windows /Mac) can do such big favor for you. Overall it’s an all-in-one Video/Blu-ray/DVD converter that can quickly convert 3D ISO image files to 3D SBB MP4, MKV, etc formats for Homido V2 VR headset playback. Additionally, you can also rip 2D/3D Blu-ray, 3D DVD, videos, ISO/IFO files to 3D side-by-side/top-and-bottom/Anaglyph, MKV, MP4, MOV, AVI, WMV formats for viewing on Gear VR, Cmoar VR, Oculus Rift DK2, and more. Thanks to the built-in editor, you can edit your 3D videos in clicks. Install and launch the best 3D ISO Video Converter, simply click “Load File” to load your 3D ISO image files to the program. 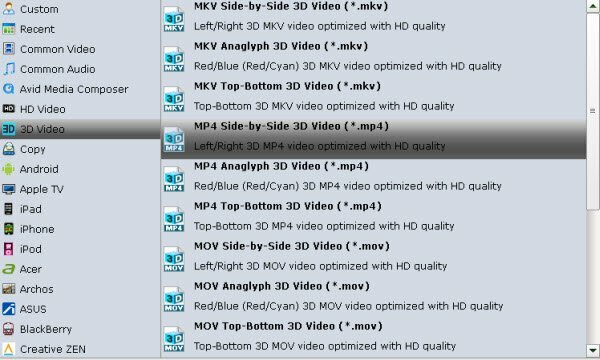 Tap the “Format” bar and select “MP4 Side-by-Side 3D Video (*.mp4)”, “MKV Side-by-Side 3D Video (*.mkv)” from “3D Video” category as the output format. It works on Homido V2 VR perfectly. Tip: If you like, you can click “Settings” to adjust your target video size, bitrate, frame rate and 3D depth. To get best video quality, you’d better switch them to “original”. Tap the “Convert” button to rip and convert 3D ISO to 3D SBS MP4/MKV format for Homido V2 VR headset. After the conversion, you can click “Open” to locate the output videos. Then transfer them to Homido compatible iOS/Android smartphone and play the converted 3D ISO files on Homido V2 VR headsets without hassle. follow your tips, I can smoothly watch 3D ISO image files on VR headset.